This is a handy set to have around. Each square is finely ground stainless steel. All have common beam and blade widths and thicknesses which will allow them to be used in combination. 2", 3", 4" & 6" squares. These are really nice. I am a hobbyist and these will be great for what I need them for. Fledgling home shop machinist. These help greatly glad I got them. I bought these squares to ensure that my end mills and milling product are square. I am very pleased with these squares and the different sizes to ensure the squareness of my milling project . I needed a good machinist square set and I am pleased with the purchase. lt would be nice to have a larger set available but this set will do nicely. I would highly recommend this set to anyone needing or wanting a higher level of accuracy when measuring and marking. Would definitely purchase again if I needed to. I was disappointed that this set did not come with a case. One reason I chose Grizzly is your shipping times are the fastest compared to other tool vendors I use. Thank you. These are nicely sized, stand on their own and accurate. Very sturdy construction that should last me many years. 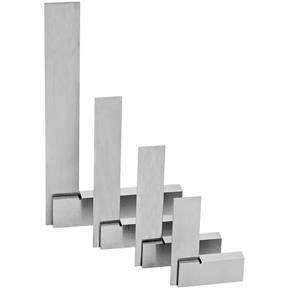 I have always wanted a set of machinist squares, I do woodworking so I didn't need the most exact squares ever and didn't want to pay a ton. These came packed well and in oil, there was a very minor ding on one of them but not where it affects anything. They are developing some slight rust dots but that is my fault, i just put them on a magnet in my garage and I live in Houston, guess i should have stored them in something without air or kept an oil layer on them. Not sure what grade of steel they are. I absolutely love these squares! 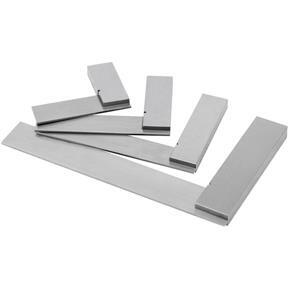 They are perfect for precision cuts! Would recommend these to anyone needing them especially at the low price point! Product is accurate and withing specs as advertised. 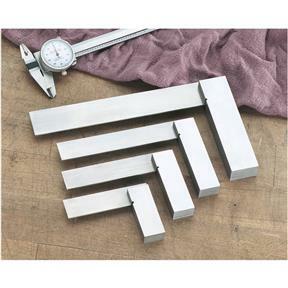 Nice set of 4 squares making it easy to find a fit for any situation. I've been very impressed with the quality of these machinist squares. They certainly are made to the European standard. These small squares are jost right. I should have bought them years ago!!! Just what I needed for building the cabinets for my wife's DREAM kitchen. You need quality tools to produce quality work, and these ARE quality tools! I have never owned a machinist's square and didn't realize how handy they were. But now I don't know how I ever managed without them. It is a nice set. Really like the smaller ones for small work and tight places. And a really great price and fast shipping. I purchased this set so that I can utilize them to check and tune-up my woodworking machines. After cleaning the preservative coating off, I check all four of the set and found them to be true and square. Nice set that should last me a very long time. I've had the medium size for years and use it all the time. The others are handy for tight spaces, my apron pocket, and for when I want a slightly longer reach. They're more precise than I am. A bargain too. These squares are about as perfect as you can get. They are fantastic!!! I use this everyday in my setup process to check square on my jointer, miter saw and milled lumber. You will be pleased. I bought this about a month ago and I'm so glad I did.